Thank you for considering Cornerstone Dental for you and your family’s dental needs. Cornerstone Dental is located in the Cornerstone Mall in Cimarron Common in South Okotoks. We are right next door to Quizno’s and the Harvest Moon Health Foods Store and directly across from Mark’s Work Warehouse. We are pleased to welcome ALL new patients and look forward to establishing a long term relationship with you and your family. 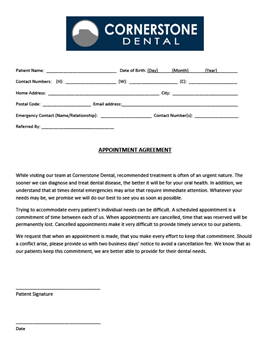 New Patients are free to download and fill out these documents below to help facilitate your intake. Should you have any questions, please contact us at (403) 995-1800 and our friendly administration team will be glad to assist you. Evaluating your teeth alignment, including your bite. Discussing your general health in relation to your oral health. Your dental appointment time will be a special consultation time with your Cornerstone Dental. Cornerstone Dental and his team will take all the time necessary to discuss your dental health levels, needs, and goals. Our goal is to keep you aware of your dental health needs. To accomplish this, we keep in touch with our patients via whatever technology they are most comfortable with. Whether that is by email or even a simple phone call, we will make sure that it fits with your schedule to help you attain your dental health goals. Call Cornerstone Dental at (403) 995-1800 to request your New Patient Consultation appointment today.